DreamWorks is in serious sale talks with a Japanese bank that is valuing the company at $3.4 billion. The three biggest individual shareholders of the company are loyal Democratic donors who are about to get a lot richer. Jeffrey Katzenberg, who is the founder and CEO of DreamWorks, owns 934,183 shares of the company, and Japanese SoftBank is said to have offered $32 a share. The sale would bring in $29,893,856 for Katzenberg, who would also sign a five-year contract to stay with the company. Katzenberg annual earnings as CEO of the company increased by 160 percent to $13.5 million last year, even though the share price of the company increased by a fraction of that amount. Katzenberg, however, isn't the richest Democratic donor heavily invested in DreamWorks and the others are set to make far more than he would off the sale to SoftBank. David Geffen, who was a cofounder of the company, owns 3,078,387 shares. The sale of DreamWorks would send $98.5 million to Geffen, who already is the owner of the seventh tenth largest yacht in the world. His vocal support of Obama during his primary battle with Hillary Clinton in 2007 made waves that helped Obama become the Democratic nominee and eventual president. Steven Spielberg owns even more stock than Geffen. His 5,170,499 shares of the company will make him more than $165 million from the potential sale. Spielberg is worth more than $3.6 billion. 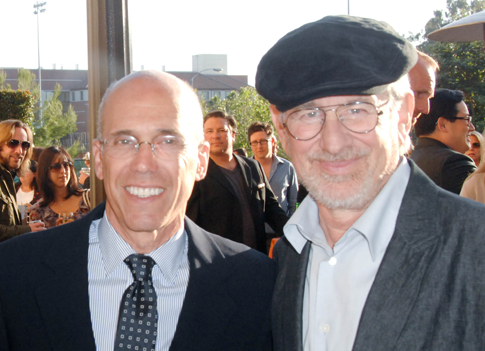 Along with Katzenberg, Spielberg has been one of the largest contributors to liberal Super PACs in recent years, including for elections across the nation during this election cycle. Update: Free Beacon superfan Shoq (possibly not his real name) notes that Geffen's yacht is actually the tenth-largest, as opposed to the seventh-largest, in the world. The Democratic mega-donor's yacht reportedly cost $290 million, originally. We deeply regret the error. This entry was posted in Politics and tagged Democratic Donors, Jeffrey Katzenberg, Steven Spielberg. Bookmark the permalink.